Back in my senior year of high school, I was fascinated by the information I learned in my one-semester Psychology class. Not quite fascinated enough to pursue it further (because, science), but still… Little did I know that twenty years later I would be reading everything I could find about neurology, which is even more interesting and complicated (for me, anyway) than psychology. Of course, when the opportunity came to read and review A Life in Balance, the story of Frank Belgau, as told to his son Eric. The book takes us through the journey of how the Learning Breakthrough Program came to be. I love that instead of just launching into the specifics of his program and all kinds of neurological tidbits about why it works (which I like to read, but can get tedious after a while), Frank started with his own story. He shares about his own reading difficulties as a child, and how he accidentally discovered that movement and coordination was linked to his learning disability. He uses humor, and certainly isn’t afraid to poke fun at himself, as he takes us briefly through his military experience — at least the part that he deems relevant to his later work — and his life in academia. Frank Belgau is man who was born to be a teacher, but who only ended up as one accidentally. He’s not afraid to admit that he learned from his students as they learned from him — or maybe it was that they learned together. he treated students in his “Minimally Brain-Damaged” classes as if they were the intelligent, creative people they were rather than the shadows the system wanted them to be. The only thing that threw me was, I was a little confused when he spoke about first meeting his current wife. (Which is a sweet story, by the way.) He met her because her seven-year-old daughter was in his program at the University of Houston, and he says, “I then asked her how she could have nine children when her daughter was only seven.” We do get an explanation (you’ll have to read the book! ), but why would he assume that the seven-year-old was her oldest child? I just thought it was odd that that was included. While there are a few exercises at the end of the book that anyone can do at home (you’ll need some space, probably outside – most of the activities need 20-25 feet), that’s not the focus of the book. Rather than just medical jargon (although there is a little of that), A Life in Balance is the path of discovery, full of both failures and successes. I highly recommend it to parents, teachers, school administrators, and anyone interested in the science of how movement is related to neurology. 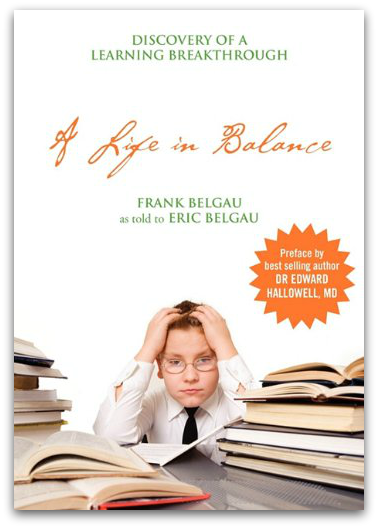 A Life in Balance is currently $16.94* and can be purchased here. *Price is current at the time of this review, and is subject to change. This entry was posted in The Old Schoolhouse Review Crew and tagged ADHD, ADHD alternative treatment, autism, book review, Brain Fitness, Brain Training, dyslexia, Dyslexia treatment, learning disabilities, Reading improvement, special needs by Amanda Beaty. Bookmark the permalink.